You think you’re getting a great deal on a printer, and then you go to replace a cartridge and find the replacement cartridge costs more than $100. Although manufacturers sell laser printers and inkjet printers cheaply, they keep the replacement toners and inks relatively expensive. This business model is how printer manufacturers make their money. You do have more cost-effective options, though, than buying the original equipment manufacturer (OEM) cartridges. Compatible and remanufactured printer cartridges are much cheaper than OEMs. Let’s say you need to replace the black ink cartridge on your HP OfficeJet 4620 printer. The retail price of the OEM one is $23.99 while the compatible cartridge is only $5.99. You still get the same high-quality printing results and ink level indicator that an OEM would provide. Many printer manufacturers discourage you from using compatible or remanufactured cartridges because of course that disrupts their business model. They’ll claim that your printer’s warranty will be voided if you use a non-OEM cartridge. But according to the U.S. Magnuson–Moss Warranty Act, warrantors cannot require that you only use brand name parts and supplies with their products, as some printer manufacturers imply. So rest assured that when you purchase a compatible or remanufactured cartridge, it will work just as well an OEM and won’t void your warranty. 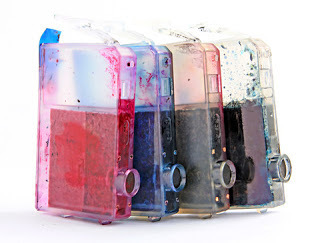 However, certain inkjet models have become much more efficient in recent years. For instance, the Epson B-510DN has ink costs as low as 4 cents per color page, color print speeds of 18 ISO ppm, and a monthly duty cycle of 20,000 pages. Those specs suggest that this inkjet printer is just as economical and powerful as some laser printers. What printer myth would you like to see debunked? Comment below or let us know on Facebook and Twitter.